Richard Edward Glover was born February 6, 1950 in Bayonne. Rich grew up in Jersey City. Strong and quick, he gravitated toward football, where he became a standout lineman. He starred for Roy Corso’s Snyder High Tigers in the late 1960s before earning a scholarship to the University of Nebraska, where he played defensive tackle and middle guard. 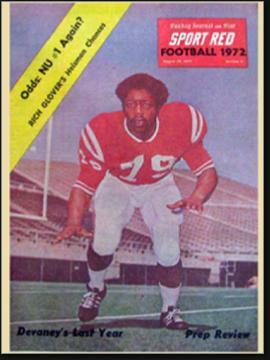 As a sophomore in 1970, Rich was a member of the Cornhuskers’ first national championship team. In 1971, he had a great game against Alabama on Thanksgiving Day, propelling Nebraska to a second straight national title. Rich’s quickness and intelligence created nightmares for offensive linemen, who were used to dealing with the larger, slower defensive tackles of his era. 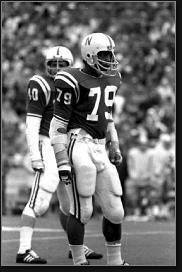 At 6’1” Rich was somewhat undersized for an interior lineman in the NFL. The Giants drafted him in the third round in 1973 and he played one year for New York beside Nebraska teammate Larry Jacobsen. In 1974, the World Football League began play and offered lucrative contracts to “name” players. Rich took a deal from the Houston Texans, who moved to Shreveport midway through the season. Rich was the young star on a team of veterans, including Don Maynard, Jim Nance, Glen Ray Hines and Richmond Flowers. Mike Villapiano—brother of Phil Villapiano—was a linebacker on the team. Rich returned to the NFL in 1975 with the Philadelphia Eagles. He started all 14 games for the Eagles, who went 4–10. It was his final year in pro football, as a knee injury ended his career the following summer. Rich went into teaching and coaching, initially on the West Coast and later for Dickinson High in Jersey City—until state funding cuts prompted the school to drop its football program. He stayed as a phys ed teacher, while also coaching football at Ferris High in Jersey City. Nebraska retired Rich’s #79, and in 1995 he was enshrined in the College Football Hall of Fame. In 1999, Rich was honored by Sports Illustrated as the starting defensive tackle on its all-time NCAA team beside Bronko Nagurski—and ahead of Buck Buchanan, Randy White and Lee Roy Selmon.